Philadelphia can soon hope to see a Bike Share program like the successful programs in Washington, DC, Boston, and Minneapolis. The Nutter Administration plans to ask the Philadelphia City Council for $3 million to get a program with 650 bikes on the streets by early 2014. An additional 550 bikes would be added in 2015. Riders will be able to buy daily, weekly, or monthly memberships from vending machines and take any available bike out from a bike station. Based on rates from other programs the first half hour would be free, each additional half hour would be $5. 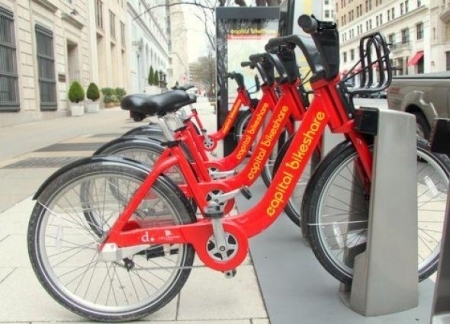 The cost to setup up the program including buying the bikes and building the stations would require an additional $5-6 million from the state or federal level. Operating expenses would be paid for by the riders, advertising, and sponsors at the cost of $23,000/year per 10 bike station. The area served by the bike share program would roughly be the Delaware River to 41st Street in West Philly and Temple University to South Street. The bikes are heavy (40 lbs) three-speed models with broad seats, fenders, and have a wire basket. Hopefully functional and not very attractive for theft. They are still working on the issue of how to allow riders who do not have a credit/debit card to use the system, especially those who are low income. Usually you need a card to gain access to the bike, for liability in case the bike is never returned. Many have been waiting for a bike share program in the city for a long time. Now that there are expanded bike lanes in Center City, the administration wants to move forward and build the program.